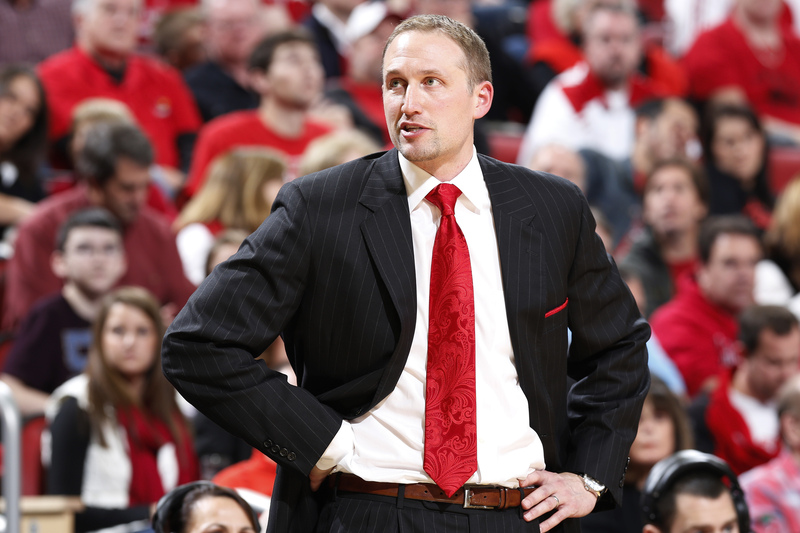 When Dan Muller inked his signature to become the next head coach of Illinois State men’s basketball in May 2012, he quickly implemented a new tradition for the program. Following every win at Redbird Arena, the players eventually head to to the student section and join the “Red Alert” in singing the school’s fight song. Over each of the past six home games, the Redbirds (16-4, 8-0 Missouri Valley Conference) have delivered this joyful moment to their peers. But after a 76-62 victory versus Wichita State (18-4, 8-1) on Jan. 14, guard DJ Clayton noticed an uncommon level of exhilaration in the stands. The outcome handed ISU sole possession of first-place in the Missouri Valley. “Everyone (fans) doesn’t like Wichita (State), so it was just a great atmosphere,” Clayton said. Within the contest, the Redbirds’ fan base witnessed a dominant showing on defense, as Muller’s unit held the Shockers to a 34.9 percent clip from the field. That wasn’t an anomaly, either. Due to a reestablished, zealous effort on that end of the floor, ISU has carved itself an opportunity to return to the NCAA Tournament for the first time since 1998. In order for the group’s undefeated run in the Missouri Valley to occur, the alumnus-turn-head coach says the team overcame an abundance of defensive lapses during the non-conference slate. To tip off their schedule, the Redbirds blew a seven-point lead with under three minutes left against Murray State, allowing the Racers to score 18 points during that span. In subsequent losses to TCU and Tulsa, each opponent shot around 50 percent down the stretch. Thus, prior to beginning of conference play, Muller challenged his personnel to exhibit additional on- and off-ball intensity in practice. Immediately, he saw them buy-in. Currently, the Redbirds sit No. 3 in Division I in opponents’ field goal percentage (36.9), along with placing No. 10 in adjusted defensive efficiency (.91 points per possession) under KenPom’s rankings. With ISU typically running a man-to-man defense, Muller credits senior guards Paris Lee and Tony Wills’ ability to halt penetration from the top of the arc, forcing the opposition into contested jumpers. On top of that, ISU yields a mere 57.5 points per game to conference foes, good for first in the Missouri Valley. While the team plays in a mid-major conference, three of the nation’s top four scoring defenses (St. Mary’s, Central Florida, Southern Methodist), who permit under 60 points per contest, do as well. Considering how the Redbirds began the season defensively, their current performance might hold even more impressive stature. Moreover, the aforementioned Lee displays another defensive facet through the steals department, averaging 2.2 of them per game. Not only is he the all-time leader in steals at ISU (227), but the Maywood, Ill. native has also positioned himself as the active steals chief in Division I. Muller says the 6-foot-1, 185-pounder was extremely effective at creating deflections from the get-go, but his improved footwork allowed him to force more turnovers. “I told myself (entering college) I wanted to leave my name in the record books for something,” Lee said. Ever since he became an upperclassman, Lee says Muller expected him to act as the leader on each side of the court. But prior to his final campaign in Normal, Illinois, the floor general believes he put too much emphasis on scoring. Now, he focuses on being a facilitator and his assist total (5.3 per contest) has vaulted upward from a year ago (3.7 apg) in the process. He’s even notching a healthy 12.7 points per game, too. Hawkins with the dunk! @Redbird_MBB tops Fort Wayne, 75-57. His refurbished mindset aided forward Deontae Hawkins’ production, resulting in a team-high 15 points per contest. The 6-foot-8, 220-pound forward is hitting a career-high 44 percent of his threes, thanks to cleaner looks via Lee. Fellow big man MiKyle McIntosh, who ranks second on the bunch in scoring (13.9 ppg), can also spread the floor with a 37.9 percent clip from behind the arc. “(Because Muller trusts us), he doesn’t care what shots we take as long as we play hard on defense,” Lee said. Considering the tournament selection committee stands weeks away from printing out its final bracket, Muller recognizes there’s a long way to go before the Redbirds safely seal their ticket to the Big Dance. Yet given ISU’s overall success, he says the team would be capable of making a run in March Madness. “As an alum, I’m disappointed it [an NCAA Tournament birth] hasn’t happened yet [in my tenure],” Muller said. “They’re [fans] ready to see the Redbirds back in the dance,” Muller said.